Last night was an emotional night at the Center for Women & Children (CWC). I was in my office getting ready for the graduation of four beautiful women from Higher Ground, our addiction recovery program, when I got an urgent call to head down to the front desk. When I got there, I found a woman flanked by two local police officers. The woman was beside herself as Child Protective Services had just taken custody of her two children. When the officers left with her children in the back of their vehicle, she fell to the ground and sobbed uncontrollably…the wholehearted, all-consuming, body shaking, can’t catch your breath, coming from your soul type of cry. I sat on the floor across from her and silently prayed. There were no comforting words in that moment, no discussion of next steps, no questions about what, why, and how. Just sobbing and praying. That happens at the CWC. We are often witnesses to the lowest of the low life moments for those we serve. And during those moments, our role is to be like Job’s friends – before they messed up and starting talking! We sit. We listen. We pray. And we experience the moment with those we have the privilege of serving. It’s as beautiful as it is terrible. A short while later, after this heartbroken woman had caught her breath, I walked across the hall to the dining room for the graduation. The room was full of the graduates’ family and friends. There was SO. MUCH. JOY. 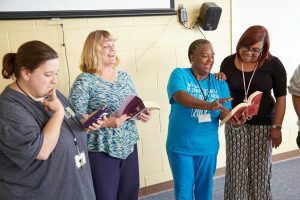 One woman shared her testimony of how God, through Wheeler, brought her through addiction and back into a relationship with her children (ironic, huh?). Women cheered; she got a standing ovation. There were tears (we do A LOT of that). Then there was music, singing, and even a bit of dancing. The process repeated through the next three graduates. Each story was amazing and surrounded by a chorus of support. The evening ended with cake. I smiled, laughed, sang, played with some babies, hugged a few people, and licked the frosting off the knife from cutting the cake (I did that part alone in the kitchen – I’m a professional after all). Then I headed back across the hall to check on the first woman. Staff had given her Kleenex and a bottle of water. With swollen eyes and a red nose, she told me how she had really wanted to just take off and disappear into whatever the night held for her, but she intentionally chose not to. For the sake of her sweet children, she chose to make the next right choice and stay. She hugged me and told me how no one had ever treated her with the kindness she received from our staff. After leaving her and going outside to my car, I turned around and looked up at the building. I couldn’t help but pray for women inside, the staff loving them through laughter and tears, and for the women still on the streets because we are beyond capacity with no available beds. I am trusting God will bring support to the Building for Change Campaign! There are so many more who need to feel hope and find their laugh.